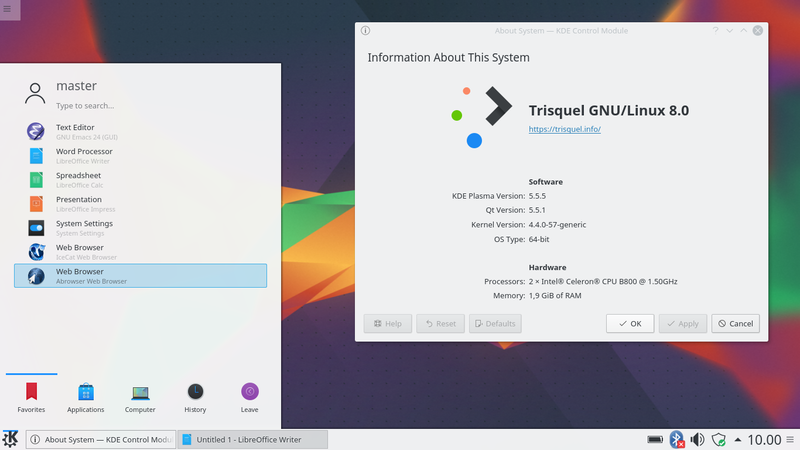 This short tutorial explains how to install Plasma 5 desktop environment at Trisquel 8 "Flidas". You will know what command used, what minimum packages needed, and some important notes (including how much 'MB of data' needed). Enjoy Plasma! plasma-desktop: package name that installs whole KDE Plasma Desktop. This has Plasma version 5.5 at this time from Flidas repo. plasma-nm: package name that installs the Network Manager at system tray. This has version 5.5 at this time. dolphin: package name that installs the Dolphin File Manager of KDE. This has version 15.12 at this time. sddm: package name that installs the login screen of KDE. kde-spectacle: package name that installs the screenshot taker program. apt-get install: the command to install packages. Don't leave the screen! You will be asked whether to use SDDM or stay at GDM on Terminal. Just select SDDM and press Enter. This whole installation downloads around +/-300MB of data. Make sure you have sufficient internet bandwidth and disk space. You need to re-login to make Spectacle works. It's better to restart to see if all Plasma installation working properly. Plasma (sometimes KDE Plasma or Plasma Desktop; formerly KDE Desktop) is a user-friendly desktop for GNU/Linux. If you install Plasma, your system will get a good-looking, fully-functional desktop that is very similar to MS Windows for daily purposes. If you use Plasma, you get all these familiar features: bottom taskbar panel, bottom-left menu, bottom-right system tray, control panel, you can place icons at desktop area & panel, and have Dolphin File Manager, that are all feature-rich yet user-friendly. See Plasma at the official site KDE.org. You can help the development at Donate page.